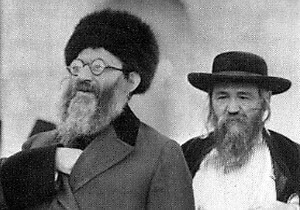 Rav Kook taught that the true goal of tzedakah is not to assist the poor, but rather to refine the character traits of the person giving. After all, if the purpose was to help the poor, God could have provided other means for their support without having to rely on the generosity of society. Below are two stories which illustrate Rav Kook’s remarkable generosity. Both incidents occurred during the years that he served as chief rabbi of Jaffa, from 1904 to 1914. These incidents were not meant to serve as an example for others, but were simply natural expressions of the rabbi’s profound caring and compassion for those who needed help. Rav Kook’s wife once appeared before the community directorate of Jaffa, headed by Mr. Meir Dizengoff, with a serious complaint. She had not seen her husband’s salary for months and had no means of support. The leaders of the community were shocked. After investigating the matter, however, they discovered that the rabbi himself was distributing his income to the needy. The leaders asked Rav Kook how he could act in such a manner, caring more for strangers than his own household. From that day on, the treasurer of the community was given strict orders to give the rabbi’s salary only to his wife. In 1907, the Jaffa correspondent for the Chavatzelet newspaper published an article criticizing the Anglo-Palestine Bank (now known as Bank Leumi). Apparently, a man applied for a loan in the bank and was asked to provide eleven guarantors. The man managed to find fourteen people who were willing to sign, one of whom was Rav Kook. The bank, however, disqualified most of them - including the rabbi. The correspondent’s conclusion was that the bank deliberately discriminated against religious Jews.